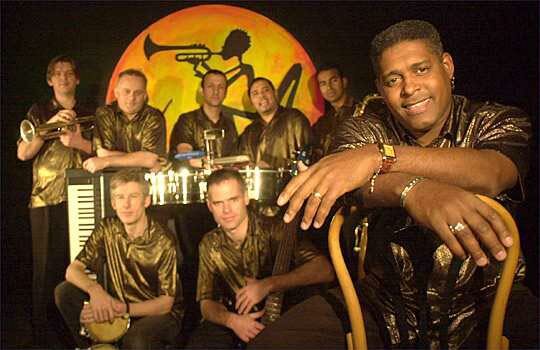 Salsa Tropical brings you the best in Latin American music and dance. Take, for example, Caché. 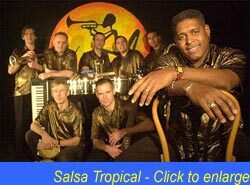 They are a wonderfully authentic Salsa band. Their passion for the music is infectious and gets both salsa enthusiasts and those new to the sensuous Cuban rhythms straight onto the dance floor. Lively and accessible the band bring a vibrant spark to all the different rhythms that make up Salsa - mambo, rumba, cha-cha, bomba, merengue, bolero. Caché can reduce to a smaller ensemble for more intimate functions but for the full Salsa experience, they perform as a 10-piece with a searing, scintillating brass section (trumpet, trombone and saxes), three percussionists, piano, bass and at the front, two extrovert lead vocalists, whose male and female harmonies give this combo the edge. Furthermore, we can provide first rate salsa dance couples in beautiful costumes to perform with the band or to their own backing tracks and whether you just want to a bit of fun participation or full-on dance workshops, these people have the skills to make you shake off your inhibitions and shake your hips! This is what live entertainment should be all about - a characterful ensemble, great music and loads of fun!